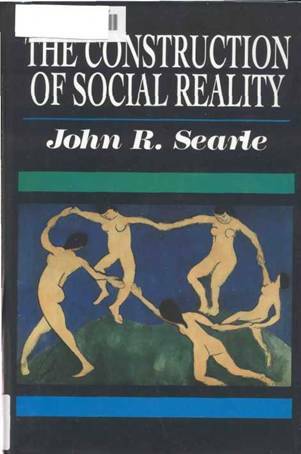 The construction of social reality/ John R. Searle. 2. Philosophy of mind. I. Title. 8. Does the Real World Exist? 177 Part II: Could There Be a Proof of External Realism? The first version of these ideas was presented as the Immanuel Kant lectures in Stanford in 1992. Subsequent versions were presented as the Thalheimer Lectures at Johns Hopkins, the Hempel lectures at Princeton, and as a series of lectures at the College de France in Paris. I have also presented this material in seminars in Berkeley and at the University of Graz in Austria. Several of my colleagues read parts of the manuscript and made helpful criticisms. Special thanks are due to Kent Bach, Martin Jones, Lisa Lloyd, Brian McLaughlin, Stephen Neale, and Neil Smelser. Robert Harnish, Meleana Isaacs, Saul Kripke, Francois Recanati, David Sosa, and Charles Spinosa. For exceptional hospitality during the course of writing this book, I am grateful to Ann and Gordon Getty and Drue Heinz. Thanks are also due to the entire passenger list of the Midnight Saga and the Rosenkavalier for putting up so graciously with my relentless pounding on the computer. Special thanks to my research assistant, Jennifer Hudin, who was helpful at every step of the way, from the earliest formulation of the basic ideas to the final preparation of the index. As always my greatest debts are to my wife, Dagmar Searle, to whom this book is dedicated. these particles are organized into systems that are conscious biological beasts, such as ourselves? Because these questions concern what might be thought of as problems in the foundations of the social sciences, one might suppose that they would have been addressed and solved already in the various social sciences, and in particular by the great founders of the social sciences in the nineteenth century and the early parts of the twentieth century. I am certainly no expert on this literature, but as far as I can tell, the questions I am addressing in this book have not been satisfactorily answered in the social sciences. We are much in debt to the great philosopher-sociologists of the nineteenth and early twentieth centuries-one thinks especially of Weber, Simmel, and Durkheim-but from such acquaintance with their works as I have, it seems to me that they were not in a position to answer the questions that puzzle me, because they did not have the necessary tools. That is, through no fault of their own, they lacked an adequate theory of speech acts, of performatives, of intentionality, of collective intentionality, of rule-governed behavior, etc. This book is an attempt to answer a set of traditional questions using resources that I and others have developed while working on other related questions. idea that there is a real world independent of our thought and talk, and to defending the correspondence conception of truth, the idea that our true statements are typically made true by how things are in the real world that exists independently of the statements. 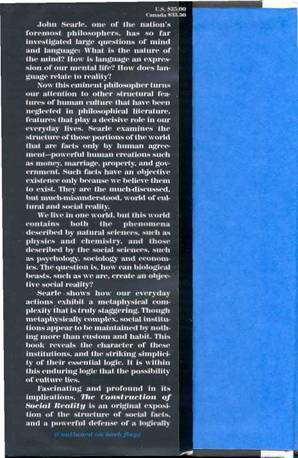 I think that realism and a correspondence conception are essential presuppositions of any sane philosophy, not to mention of any science, and I wanted to make clear some of my reasons for thinking so. But what was originally intended as fairly short introductory material developed a life of its own, as is usually the case with such large philosophical questions. When the first chapter grew to three I decided to move all of this material to the back of the book, lest it overbalance my main argument. Chapters 7 and 8 are discussions of realism, Chapter 9 is a defense of a version of the correspondence conception of truth. Notice, furthermore, that though my description was intended to be as neutral as possible, the vocabulary automatically introduces normative criteria of assessment. Waiters can be competent or incompetent, honest or dishonest, rude or polite. Beer can be sour, flat, tasty, too warm, or simply delicious. Restaurants can be elegant, ugly, refined, vulgar, or out of fashion, and so on with the chairs and tables, the money, and the French phrases. If, after leaving the restaurant, I then go to listen to a lecture or attend a party, the size of the metaphysical burden I am carrying only increases; and one sometimes wonders how anyone can bear it. One reason we can bear the burden is that the complex structure of social reality is, so to speak, weightless and invisible. The child is brought up in a culture where he or she simply takes social reality for granted. We learn to perceive and use cars, bathtubs, houses, money, restaurants, and schools without reflecting on the special features of their ontology and without being aware that they have a special ontology. They seem as natural to us as stones and water and trees. Indeed, if anything, in most cases it is harder to see objects as just natural phenomena, stripped of their functional roles, than it is to see our surroundings in terms of their socially defined functions. So children learn to see moving cars, dollar bills, and full bathtubs; and it is only by force of abstraction that they can see these as masses of metal in linear trajectories, cellulose fibers with green and gray stains, or enamel-covered iron concavities containing water. things that exist. We will have to make some substantive presuppositions about how the world is in fact in order that we can even pose the questions we are trying to answer. We will be talking about how social reality fits into a larger ontology, but in order to do that, we will have to describe some of the features of that larger ontology. The truth is, for us, most of our metaphysics is derived from physics (including the other natural sciences). Many features of the contemporary natural science conception of reality are still in dispute and still problematic. For example, one might think that the Big Bang Theory of the origin of the universe is by no means well substantiated. But two features of our conception of reality are not up for grabs. They are not, so to speak, optional for us as citizens of the late twentieth and early twenty-first century. It is a condition of your being an educated person in our era that you are apprised of these two theories: the atomic theory of matter and the evolutionary theory of biology. The picture of reality derived from these two theories, to state it very crudely, is as follows: The world consists entirely of entities that we find it convenient, though not entirely accurate, to describe as particles. These particles exist in fields of force, and are organized into systems. The boundaries of systems are set by causal relations. Examples of systems are mountains, planets, H2O molecules, rivers, crystals, and babies. Some of these systems are living systems; and on our little earth, the living systems contain a lot of carbon-based molecules, and make a very heavy use of hydrogen, nitrogen, and oxygen. Types of living systems evolve through natural selection, and some of them have evolved certain sorts of cellular structures, specifically, nervous systems capable of causing and sustaining consciousness. Consciousness is a biological, and therefore physical, though of course also mental, feature of certain higher-level nervous systems, such as human brains and a large number of different types of animal brains. Just to keep the terminology straight I will adopt the following conventions. 1. Since all functions are observer relative I will speak of all functions as assigned or equivalently as imposed. 2. Within the category of assigned functions some are agentive because they are matters of the use to which agents put entities, e.g., the function of bathtubs is to take baths in. 3. 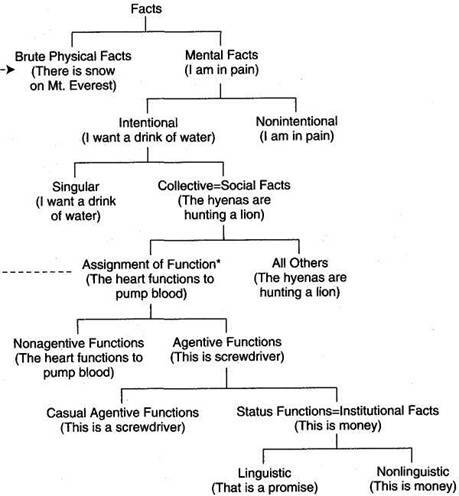 Within the category of assigned functions some are nonagentive because they are naturally occurring causal processes to which we have assigned a purpose, e.g., the function of the heart is to pump blood. 4. Within the category of agentive functions is a special category of those entities whose agentive function is to symbolize, represent, stand for, or-in general-to mean something or other. Many species of animals, our own especially, have a capacity for collective intentionality. By this I mean not only that they engage in cooperative behavior, but that they share intentional states such as beliefs, desires, and intentions. In addition to singular intentionality there is also collective intentionality. Obvious examples are cases where I am doing something only as part of our doing something. So if I am an offensive lineman playing in a football game, I might be blocking the defensive end, but I am blocking only as part of our executing a pass play. If I am a violinist in an orchestra I play my part in our performance of the symphony. By stipulation I will henceforth use the expression "social fact" to refer to any fact involving collective intentionality. So, for example, the fact that two people are going for a walk together is a social fact. A special subclass of social facts are institutional facts, facts involving human institutions. So, for example, the fact that this piece of paper is a twenty dollar bill is an institutional fact. I will have a great deal more to say about institutional facts. In my work on the philosophy of language8 I suggested the beginnings of an answer to the question concerning the relationships between those features of the world that are matters of brute physics and biology, on the one hand, and those features of the world that are matters of culture and society, on the other. Without implying that these are the only kinds of facts that exist in the world, we need to distinguish between brute facts such as the fact that the sun is ninety-three million miles from the earth and institutional facts such as the fact that Clinton is president. Brute facts exist independently of any human institutions; institutional facts can exist only within human institutions. Brute facts require the institution of language in order that we can state the facts, but the brute facts themselves exist quite independently of language or of any other institution. Thus the statement that the sun is ninety-three million miles from the earth requires an institution of language and an institution of measuring distances in miles, but the fact stated, the fact that there is a certain distance between the earth and the sun, exists independently of any institution. Institutional facts, on the other hand, require special human institutions for their very existence. Language is one such institution; indeed, it is a whole set of such institutions. In this chapter I describe the elementary construction of social facts and the logical structure of the development of institutional facts from simpler forms of social facts. To do so, I will use the apparatus of agentive functions, collective intentionality, and constitutive rules. I will also attempt to explain several puzzling features of social reality. cial objects is that the "objects" are really designed to serve agentive functions, and have little interest for us otherwise. What we think of as social objects, such as governments, money, and universities, are in fact just placeholders for patterns of activities. I hope it is clear that the whole operation of agentive functions and collective intentionality is a matter of ongoing activities and the creation of the possibility of more ongoing activities. Unconsciously, we have throughout this discussion been acknowledging this point by our talk of institutional facts rather than institutional objects. Such material objects as are involved in institutional reality, e.g., bits of paper, are objects like any others, but the imposition of status-functions on these objects creates a level of description of the object where it is an institutional object, e.g., a twenty dollar bill. The object is no different; rather, a new status with an accompanying function has been assigned to an old object (or a new object has been created solely for the purpose of serving the new status-function), but that function is manifested only in actual transactions; hence, our interest is not in the object but in the processes and events where the functions are manifested. The priority of process over product also explains why, as several social theorists have pointed out, institutions are not worn out by continued use, but each use of the institution is in a sense a renewal of that institution. Cars and shirts wear out as we use them but constant use renews and strengthens institutions such as marriage, property, and universities. The account I have given explains this fact: since the function is imposed on a phenomenon that does not perform that function solely in virtue of its physical construction, but in terms of the continued collective intentionality of the users, each use of the institution is a renewed expression of the commitment of the users to the institution. Individual dollar bills wear out. But the institution of paper currency is reinforced by its continual use. The sixth and final feature we need to explain concerns the role of language in institutional reality, and to that topic I devote the next chapter. The primary aim of this chapter is to explain and justify my claim that language is essentially constitutive of institutional reality. I have made this claim in general terms but I now want to make fully explicit what I mean by it, and to present arguments for it. At the end of the chapter I will mention some other functions of language in institutional facts. Fourth, the facts in question persist through time independently of the duration of the urges and inclinations of the participants in the institution. This continued existence requires a means of representation of the facts that is independent of the more primitive prelinguistic psychological states of the participants, and such representations are linguistic. In Chapter 4 we explored the logical structure of institutional facts. With this account of structure in hand, we now have enough material to state a general theory of the creation, maintenance, and identification of institutional facts. In the statement of the general theory I will summarize some of the material of earlier chapters in order to extend it. In this account we need to distinguish four elements: the institution, its use in the creation of facts, their continued existence, and their indication. chical taxonomy will show the place of the social, institutional, and mental reality within a single physical reality. However, constructing such a taxonomy is no simple task because several different and crisscrossing distinctions need to be recognized. With some hesitation, I provide a simplified version of the hierarchical relations between the different types of fact in Figure 5.1. * Functions are always ultimately assigned to brute phenomena, hence the line from the Assignment of Function to Brute Physical Facts. 7. Does the Real World Exist? sister of Sam, but there are further things to be said, e.g., that Sally is female, and that Sally and Sam have the same father and mother. Many philosophical disputes are about the structure of facts, and in general these issues go far beyond disquotation. For example, the philosophical disputes about color, and other secondary qualities, are about the nature of the facts that correspond to such claims as that this object is red, and the analysis of such facts requires more than disquotation. 9. One (only one) method in philosophy is to analyze the structure of the facts that make our statements true. In earlier chapters I have attempted to do that with the structure of social and institutional facts. There is another argument against the correspondence theory of truth that, if valid, would be disastrous for the theory. It is a technical-sounding argument originally attributed to Frege, used by Quine against modal logic, and recently revived by Donald Davidson against the correspondence theory; it has come to be called "the slingshot argument" (presumably because such a little David of an argument can be used to slay such huge Goliaths as modal logic and the correspondence theory). It is usually stated with breathtaking speed,14 but if we are going to explore its weaknesses we will need to slow down and go through it in low gear. Step 1. Assumption: The statement that snow is white corresponds to the fact that snow is white. 1. J. R. Searle, "What Is a Speech Act," in Black, Max ed. Philosophy in America (Ithaca, N.Y.: Cornell University Press, London: Allen N. Unwin, 1965); and J. R. Searle, Speech Acts, An essay in the Philosophy of Language, (New York: Cambridge University Press, 1969) The notion of "brute fact" in this sense is due to G.E.M. Anscombe, "On Brute Facts," Analysis 18, no. 3 (1958). 2. For an argument for the last two claims, i.e., that the notion of deep unconscious rule following is incoherent and that computation is observer-relative, see John R. Searle, The Rediscovery of the Mind (Cambridge, Mass., London: MIT Press, 1992), chaps. 7 and 9, respectively. 3. L. Wright, "Functions" in The Philosophical Review 82, no. 2 (April 1973), 137-68. See also P. Achinstein, "Functional Explanation" in The Nature of Explanation (New York: Oxford University Press 1983), pp. 263-90. 4. The use of these terms to describe the distinction was originally suggested to me by Jennifer Hudin. 5. For an explanation of the sort of imposition of intentionality involved in meaning, see Searle, Intentionality, An Essay in the Philosophy of Mind, especially chap. 6. 6. I discuss some of these in John R. Searle, "Collective Intentions and Actions," in Intentions in Communication, P. Cohen, J. Morgan, and M. E. Pollack, eds. Cambridge, Mass. : Bradford Books, MIT Press, 1990). 7. I do not wish to suggest that my views are uncontroversial or unchallenged. There are several other powerful conceptions of collective intentionality. See especially M. Gilbert, On Social Facts (London: Routledge, 1989); M. Bratman, "Shared Cooperative Activity," Philosophical Review 101, no. 2 (1992), 327-41; and R. Tuomela and K. Miller, "We-intentions," Philosophical Studies 53 (1988), 367-89. 9. A related distinction was introduced by J. Rawls, "Two Concepts of Rules," Philosophical Review 64 (1955). 10. E.g., Anthony Giddens, The Constitution of Society: Outline of the Theory of Structuration (Berkeley: University of California Press, 1984), pp. 19ff. 1. John R. Searle, Expression and Meaning: Studies in the Theory of Speech Acts (Cambridge and New York: Cambridge University Press, 1979), chap. 1. 2. I attempt to explain the relationship between the individual component and the collective component of collective intentionality in John R. Searle, "Collective Intentions and Actions," in Intentions in Communication, P. Cohen, J. Morgan, and M. E. Pollack, eds. (Cambridge, Mass: Bradford Books, MIT Press, 1990). 3. The classic text is W. Koehler, The Mentality of Apes, 2d ed. (London: Kegan Paul, Trench and Trubner, 1927). More recently, E. O. Wilson writes, "Tool using occurs sporadically among the species of higher primates, mostly to a degree no greater than in other vertebrate groups. However the chimpanzee has a repertory so rich and sophisticated that the species stands qualitatively above all other animals and well up the scale toward man." Sociobiology: The New Synthesis (Cambridge, Mass. : Harvard University Press, 1975), p. 73. 4. Werner Kummer, Primate Societies (Chicago: Aldine, 1971), p. 118. 5. This situation, by the way, still exists with British currency. On the British twenty pound note it says, "I promise to pay the bearer on demand the sum of twenty pounds." It is signed by the chief cashier of the Bank of England. 6. I will use the expressions "X term," "Y term," and "C term" to refer indifferently either to the actual entities that are the values of these three variables or to the verbal expressions that we substitute for the expressions "X," "Y," and "C." I realize that there is always a danger of a use-mention confusion, but I believe the context will make it clear whether I am referring to an expression or to an entity referred to by that expression. In cases where there might be a confusion, I will make the distinction explicit by using, for example, the distinction between "the X expression" and "the X element." The first of these will refer to an expression; the second will refer to an actual entity. University Press, 1969), and John R. Searle, Expression and Meaning: Studies in the Theory of Speech Acts (Cambridge: Cambridge University Press, 1979). 1. N. Chomsky, Reflections on Language (New York: Pantheon, 1975). 2. J. A. Fodor, The Language of Thought (New York: Crowell, 1975). 3. 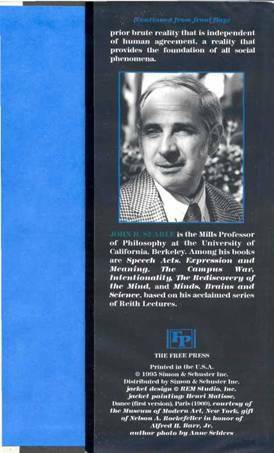 For further discussion, see John R. Searle, The Rediscovery of the Mind, (Cambridge, Mass. : MIT Press, Cambridge MA and London, 1992), chap. 7. 4. 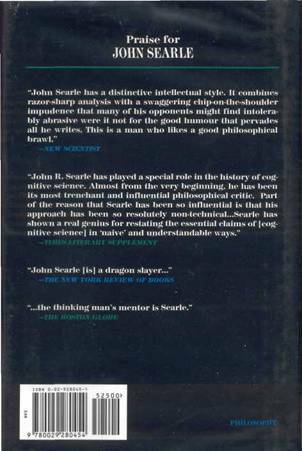 John R. Searle, Intentionality: An Essay in the Philosophy of Mind (New York: Cambridge University Press, 1983), and op. cit. supra. 5. Searle, The Rediscovery of the Mind, chap. 7. 6. The example, I believe, is originally due to Robyn Carston, "Implicature, Explicature and Truth-Theoretic Semantics," in S. Davis, ed., Pragmatics: A Reader (Oxford: Oxford University Press, 1991), pp. 33-51. 7. Ludwig Wittgenstein, Philosophical Investigations (Oxford: Basil Blackwell, 1953), part II, sec. xi. 8. Ibid., part I, para. 201. 9. Ibid., Part I, para. 324ff and passim. 10. Daniel Dennett, The Intentional Stance (Cambridge, Mass. : MIT Press, 1987). 1. An example of a realist philosopher who rejects the correspondence theory is Peter Strawson. See his "Truth" Proceedings of the Aristotelian Society, supplementary volume 24 (1950). 2. H. Putnam, Realism With a Human Face (Cambridge, Mass. : Harvard University Press, 1990), p. 23. 3. Quoted by N. Goodman, Of Mind and Other Matters (Cambridge, Mass. : Harvard University Press, 1984), p. 36. 4. H. R. Maturana, F. J. Varela, Autopoiesis and Cognition, The Realization of the Living (Dordrecht: D. Reidel, 1980). 5. Terry Winograd, "Three Responses to Situation Theory," Center for the Study of Language and Information, Report No. CSLI-87-106, 1987, and Terry Winograd and Fernando Flores, Understanding Computers and Cognition (Norewood, N.J.: Ablex, 1986), chap. 5. 6. G. Levine, "Looking for the Real: Epistemology in Science and Culture," in G. Levine, ed., Realism and Representation: Essays on the Problem of Realism in Relation to Science, Literature and Culture, (Madison: University of Wisconsin Press, 1993), p. 13. 7. J. Derrida, Limited Inc. (Evanston, Ill.: Northwestern University Press, 1988), p. 136. 8. Putnam, Realism with a Human Face, p. 96ff. H. Putnam, The Many Faces of Realism (LaSalle, Ill: Open Court, 1987), p. 18ff. 9. N. Goodman, Of Mind and Other Matters, p. 36. 10. Putnam, Reason, Truth and History (Cambridge: Cambridge University Press, 1981), p. xi. The phrase is repeated in The Many Faces of Realism, p. 1. 11. Ludwig Wittgenstein, Philosophical Investigations, (Oxford: Basil Blackwell, 1953), part.1, para. 464 (my translation). 12. I apologize for the brevity of this discussion. I have discussed these same issues in greater detail in chap. 2 of Intentionality. For the best argument against the sense datum theory, see J. L. Austin, Sense and Sensibilia (New York: Oxford University Press, 1962). 13. Ludwig Wittgenstein, Tractatus Logico-Philosophicus (London: Routledge and Kegan Paul, 1922). should turn out that the concept of "truth" is not radically nonepistemic, then we should simply have to get another concept that was, for we need a nonepistemic term to describe the correspondence between our statements and the radically nonepistemic real world. Chapter 8. Does the Real World Exist? Part II: Could There Be a Proof of External Realism? 1. I have to say "in general" because, for example, some statements are self-referential, e.g., "This sentence is in English." 2. It is related to, but not the same as, Tarski's Convention T. See Alfred Tarski, "Der Wahrheitsbegriff in den formalisierten Sprachen," Studia Philosophica (1935) 261-405; translated as "The Concept of Truth in Formalized Languages" in Alfred Tarski, Logic, Semantics, Metamathematics (Oxford: Clarendon Press, 1956). 3. J. L. Austin, "Truth," and P. F. Strawson, "Truth," Proceedings of the Aristotelian Society 34 (1950). Reprinted in Pitcher, ed., Truth (Englewood Cliffs: N.J.: Prentice Hall, 1964). 4. Strawson, in Pitcher, Truth, p. 32. 5. Ibid., p. 40, italics in the original. 6. Ludwig Wittgenstein, Tractatus Logico-Philosophicus (London: Routledge and Kegan Paul, 1922). 7. Strawson, in Pitcher, Truth, p. 38. 9. "What is a fact? A fact is a thought that is true." Gottlob Frege, "The Thought," in. P. F. Strawson, ed., Philosophical Logic (Oxford: Oxford University Press, 1967), p. 35. 10. Strawson, in Pitcher, Truth, p. 38. 11. Such statements can no doubt be paraphrased in ways that do not mention facts, but that is beside the point. The point here is that they make sense in a way that attributing causal powers to statements does not. tions," Proceedings of the Aristotelian Society supp. vol. 7 (1927), reprinted in Pitcher, ed., Truth; P. Horwich, Truth (Oxford: Basil Blackwell, 1990), and W.V.O. Quine, Pursuit of Truth, rev. ed. (Cambridge, Mass. : Harvard University Press, 1992). 13. For more on this distinction, see J. R. Searle, Intentionality (Cambridge and New York: Cambridge University Press, 1983), p. 13. The principles are these: if a statement corresponds to the fact described by an expression of the form 'the fact that p', then it corresponds to the fact described by 'the fact that q' provided either (1) the sentences that replace 'p' and 'q' are logically equivalent, or (2) 'p' differs from 'q' only in that a singular term has been replaced by a coextensive singular term. The confirming argument is this. Let 's' abbreviate some true sentence. Then surely the statement that s corresponds to the fact that s. But we may substitute for the second 's' the logically equivalent '(the x such that x is identical with Diogenes and s) is identical with (the x such that x is identical with Diogenes)'. Applying the principle that we may substitute coextensive singular terms, we can substitute 't' for 's' in the last quoted sentence, provided 'f' is true. Finally, reversing the first step we conclude that the statement that s corresponds to the fact that t, where 's' and 'f' are any true sentences. Inquiries into Truth and Interpretation (Oxford: Clarendon Press, 1984), p. 42. 15. There are a number of criticisms of the slingshot argument. I believe the one closest in spirit to mine is in J. Barwise and J. Perry, Situations and Attitudes (Cambridge, Mass. : MIT Press, 1983).